Forget about sensors everywhere. The Internet of Things is really about networked devices making our lives easier. If your idea of the Internet of Things (IoT) involves smart environments that hoover up data from wearable sensors for more efficient traffic patterns, alert a teacher when a student's eyeballs have wandered away from the lesson or notify purchasing when the pencil stock has dwindled in the supply closet, maybe it's time to crank back expectations and look at what's really going on in K–12 with IoT. The Internet of Things describes the idea of common objects being connected to the internet to generate and exchange data. For example, a beacon could send out a signal to another system, such as a phone, to log a bit of data and let it know that something — or someone — is there and present. According to Steve Burt, the applications for IoT in the school environment currently most often involve lighting, climate control and transportation. Burt is the director of strategy for Clarity Innovations, a professional services firm that consults with education agencies, organizations and companies on technology. So far, he noted, retail is a far better venue for IoT usage than education, collecting data "to help them essentially do their job, selling things better." Data collection in schools is a far trickier business, Burt said, burdened with practical, political and legal ramifications "that are going to continue to exist as a barrier to widespread implementation or adoption." Anybody who proposes putting sensors in buildings to track student activity will face a school board that doesn't hear, "I'm trying to track usage," he suggested; they're going to hear, "I'm going to be tracking what students are doing and where they're at." And that's a non-starter. "The political concerns will throw up a lot of red flags around that." Yet, as Burt pointed out, there are countless IoT uses that could really help schools streamline operations, save money and reduce administrivia. Think about the cafeteria. While CES scenarios offer up smart refrigerators and connected inventory, a more practical use is managing student meals. "That has always been the bane of schools to have to manage school lunch tickets and who gets credit for free-and-reduced lunch and what to do when the kid has forgotten his milk money. I think that's an opportunity." Students can be supplied with a card that doesn't necessarily identify them but does tie to a lunch-money or free-meal account. The cafeteria usage is similar to the application of a system in place at Colorado's Adams 12 Five Star Schools. When students board or disembark school buses, they wave an RFID card at a small cell-phone-sized device that logs their arrival or departure, including time and location. 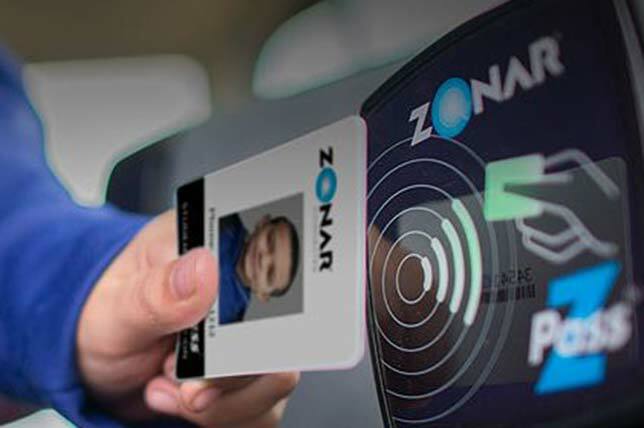 The Zonar Z Pass system has been in use at the district since 2010, said David Anderson, director of Transportation & Fleet. It covers about 11,000 kids who ride one of 163 buses. Originally, noted Anderson, the tech was brought in to handle accounting. Families were charged based on their students' ridership. But two years ago, the school board eliminated the bus fee, and now it has turned into a safety, security and risk management feature. "We know what students are on the bus. We have accountability. We know when they get off," he said. "If a student is lost or there are any questions about it, we can say, 'Your student got off at First and Main at 3:23 in the afternoon.' It time-stamps it and through GPS it's very accurate." That isn't simply a theoretical notion, he added. Parents call all the time to find out if their kids made it off the school bus. That also poses a problem. Frequently, those parents want to know where their kids have headed after getting off the bus. The district's dispatchers and schedulers have to explain that the card is basically dumb. As Anderson clarified, "There's a metal coil, like a copper coil, sealed in plastic. We can't track their student when they're off the bus. It's not 'Big Brother' at all. It's a dead card that only works [for one purpose], like door access. You scan your card. If you're in the system, it authorizes you and opens the door." Yet the system, which is tied into a GPS operation for fleet management, is practical in other ways, too, Anderson said — routing and location tracking, scheduling, maintenance, and creating a roster of students whose parents need to be notified when the bus is running late from a school event. While some businesses yearn for the day when personalization and localization will transform the shopping experience, a more pragmatic application for instant identification is opening the door. Michael England, president of St. Mary's High School in St. Louis, persuaded his archdiocese to invest in a facial recognition system in early 2015 for the school. Small vestibules in the front and back of the building are outfitted with a security camera. If the system, which comes from Blue Line Technology, recognizes the face of the person as being authorized to enter the school, the door from the vestibule to the lobby opens automatically. If it's somebody who isn't allowed, "not only will the door not unlock for them," said England, "but notifications can be sent to whoever we would like, informing us that this person is trying to get into the building." That could include the local police, as well. Behind the scenes, photos have been taken of every student, teacher and staff member and added to a database used in the vetting process. At first, the school didn't realize that the system would log a facial record of each individual with date and time as he or she came through. Eventually, it would run out of room for storage and shut down. Now, every two days the system clears itself. Also, there's no way to stop a group of students "tailgating" — coming through the door without it shutting between people. "I don't think anything is full-proof," England acknowledged. Yet it serves its purpose for those non-rush moments when foot traffic is more of a trickle, fewer people are paying attention and somebody could slip in unnoticed. One day we'll all have a JARVIS, like Tony Stark does, to manage almost everything. Until then, we have voice assistants — at least for the little things. When students come into the elementary library at St. Anne's-Belfield School in Charlottesville,VA , they can ask the trained librarian, Sarah FitzHenry, what the title of the latest Diary of a Wimpy Kid book is or, better, they can ask Google Home. The $99 voice assistant and speaker combination allows the students to pose questions of fact ("Google, who wrote, ..." "Google, what's the sum, ..." "Google, when did ...") or pursue less academic activities ("Google, beatbox, ..." "Google, tell me a joke ..."). 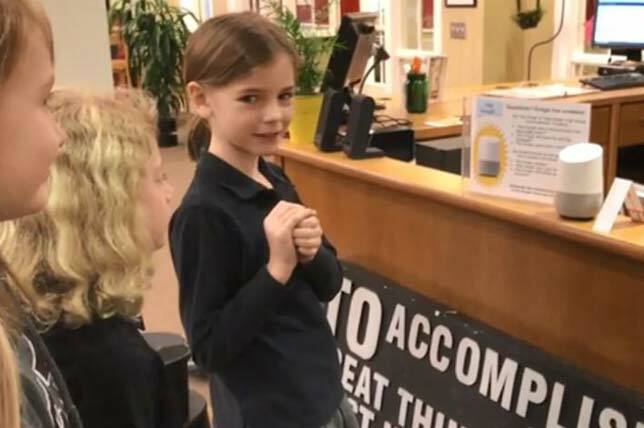 When students come into the elementary library at St. Anne's-Belfield School in Charlottesville, NC, they can ask the trained librarian, Sarah FitzHenry, what the title of the latest Diary of a Wimpy Kid book is or, better, they can ask Google Home. A self-professed "library superhero, part bibliophile, part tech geek, part glitter," FitzHenry brought Google Home into the library for several reasons. As she explained in her personal blog, "Fitz Between the Shelves," she had a lot of reasons for for introducing her young patrons to voice-enabled search. A big motivator was to "provide easy and immediate answers to low-level questions, allowing more time for deep discussion." During library time students line up to pose their questions to the wireless device and, in the process, learn how to phrase and rephrase their research questions "to get the best, most effective answers"; help them become more independent in finding books; and learn about this new form of artificial intelligence "and its role in our lives." On top of that, it's a great lesson in internet safety. FitzHenry tightly controls access to the device. It sits on the counter where she oversees her domain, so she's continually tuning into the questions students are asking. (If she's not there, it's turned off.) Because her school educates the kids starting from a very early age on privacy and online safety, they come with a good grounding in what to say and not say to Google Home, she told THE Journal. They understand, for example, not to share personal information about themselves or others. "It provides a safe place for them to experiment and to learn to use it correctly," she explained. "If they're using it at home and they're making mistakes, there might not be an adult around. And here they have an adult to make mistakes safely and learn what to do next." Even if IoT hasn't checkered the world with sensors, it's still bound to become more prevalent in our lives, "from where we shop to where we dine to where we bank — and eventually where our kids go to school," observed Clarity's Burt. It's going to be there, he said, because there are a lot of benefits: Judicious use of IoT can save us money and time. But, he added, "we have to make sure we're doing these kinds of things for the right reasons." Involve stakeholders. That'll prevent adoption of something that tech-savvy people love but users don't really care about. Bringing everybody else on board "who have a little bit of say in this game" will prevent the purchase of technology that's not going to be "used or implemented," recommended Clarity Innovation's Steve Burt. Structure the project as a proof-of-concept. Burt's advice: Tell stakeholders it's a test and that the district expects to encounter "some issues." Also, emphasize that participation is not required and give parents and students the ability to opt out. Don't be afraid to fail in front of students. It can be intimidating, said Librarian Sarah FitzHenry. "As teachers we like to know exactly what we're doing before we share it with our students. We like to be the ultimate resource. We like to have our lessons perfect before we share them. And I would argue against that. Trying new things together, learning how a new piece of technology or a new piece of software or a new app works alongside your students, making the mistake in front of them and modeling what to do when you make a mistake, can be really powerful. It's a great opportunity for students to learn skills that they're going to take with them."